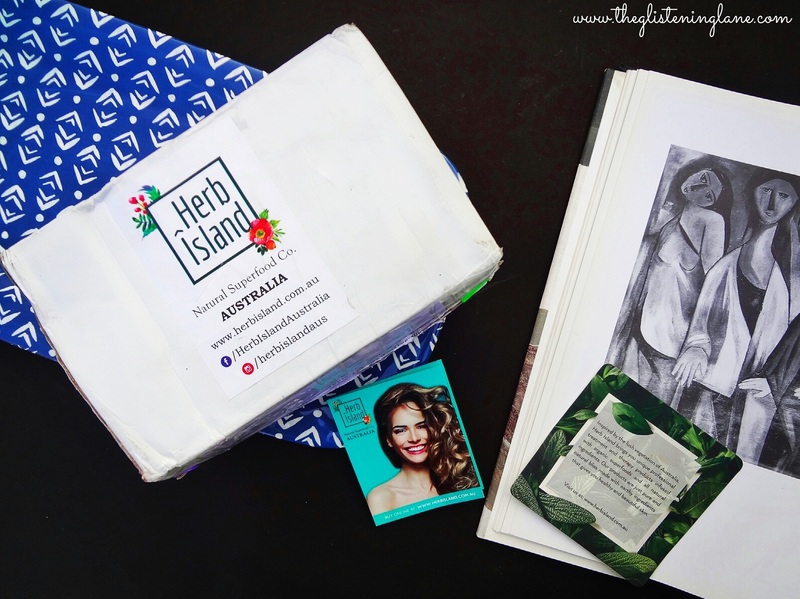 Inspired by the lush vegetation of Australia, Herb Island brings you unique professional treatment and therapy products infused with organic super-foods and all natural ingredients. Our products are just pure and natural bliss made with earthy ingredients that give you healthy and beautiful skin. We represent Australian quality standards and our product recipes are formulated using diversity of highly potent flora and gifts of nature. We are focused to deliver prime quality natural cosmetics that DOES NOT contain harsh chemicals which can be terrible to the human body in the long run. No SLS, No Parabens, No Formaldehyde, No Mineral Oil, No Paraffin Wax & No Other Petroleum. Description: Specially formulated to illuminate your skin and give an even skin tone. The excellent absorbent properties of French Clay removes excess oil while giving your skin a detoxifying beauty treatment. Aloe vera soothes and moisturizes your skin. 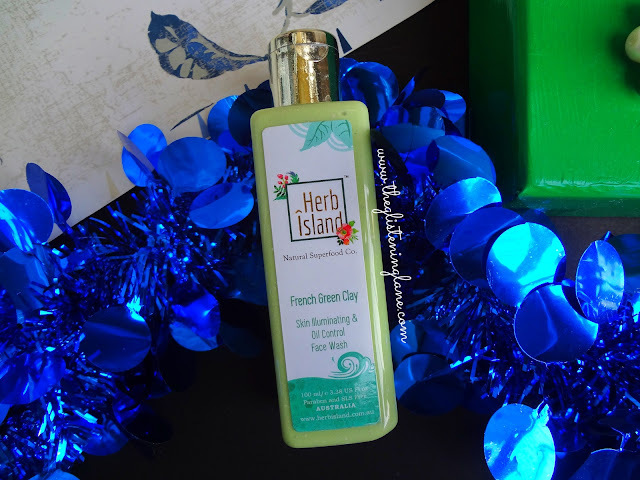 Key Ingredients: Aloe Vera Leaf Juice, French Green Mineral Clay, Vegetable Glycerine, Specially formulated gel base. Ingredients: Not Mentioned! A full ingredient list would have been preferred so that the consumers can actually validate if the product actually is SLS & Paraben Free. Directions: Massage small amount on wet face to cleanse and moisturise. Rinse well. Pat dry. The packaging of this one is pretty convenient & travel friendly. It has a flip top open lid which makes it spill proof for incorporating within the handbag. Also, it is quite lightweight and made up of plastic which also makes it break-proof. Coming to the facial cleanser, it smells somewhat like a soap which I fail to recollect. 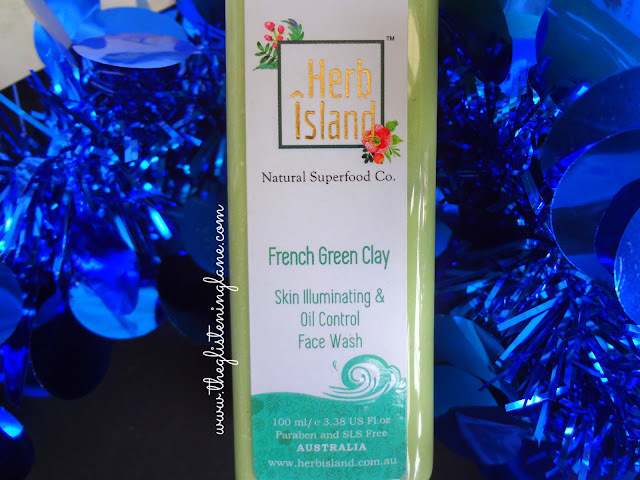 Does it smell like French Green Clay? I ain’t sure because I’ve never sniffed one. The face wash is of pastel green colour with soft while granules inside which melts away quickly once you rub it between your fingers or palms. In case you are one of those who tend to develop acne and remain distant from scrubbing granules, then don’t worry, the granule inside isn’t a scrubbing molecule. But what exactly it does, I can’t claim; again due to incomplete ingredient list. For usage, all you gotta need is little amount of the content and it would generate subtle foam. It cleanses makeup(non-waterproof) and removes dirt, grim & excess sebum. 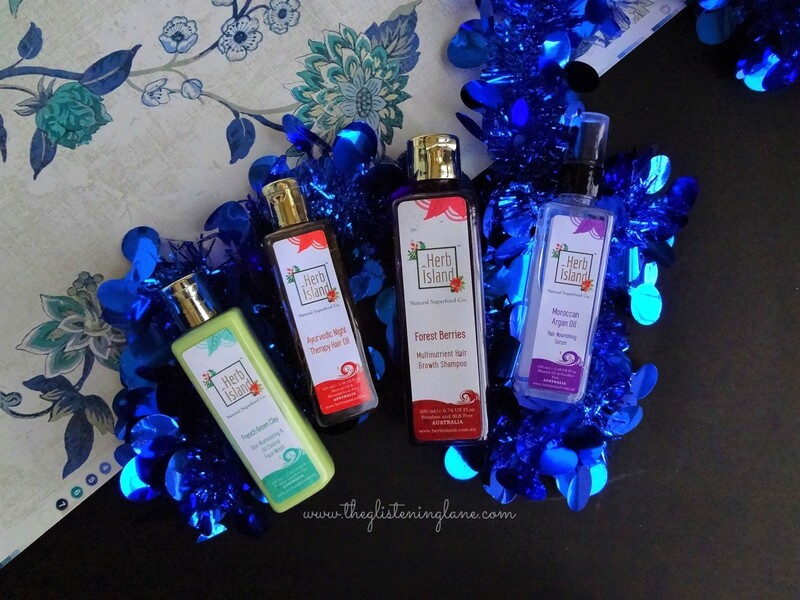 Ideally, it is meant for normal to oily skin type. If you’re someone with super-oily skin, then you may feel it's slightly hydrating. But if you prefer your cleansers cater some moisture, then you would simply love it! It gives you refreshing feel and illuminates the skin. 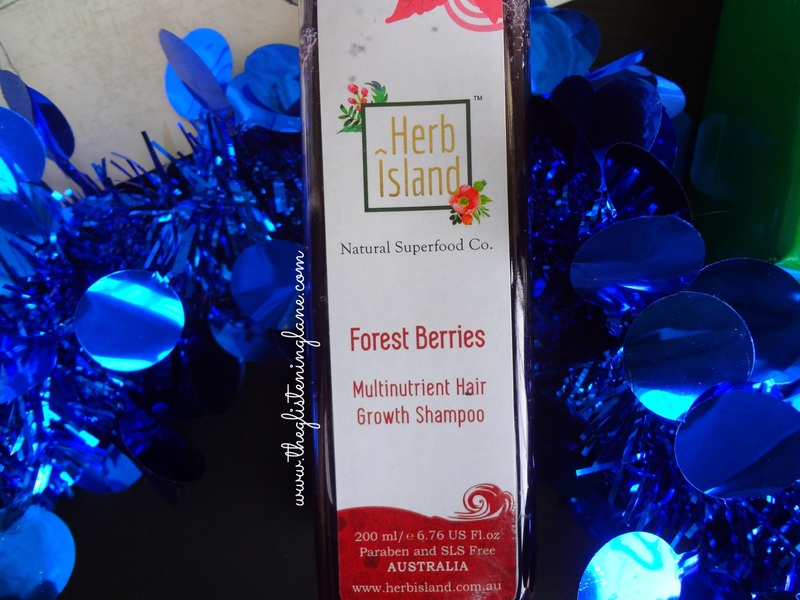 Description: Unique formulation of forest berries and hair super-foods infused with Vitamin C helps build collagen and maintain hair strength. Bearberry prevents premature graying and hair loss. Wheat germ oil is loaded with Vitamins like B1, B3 and B6 that keeps hair healthy and beautiful. 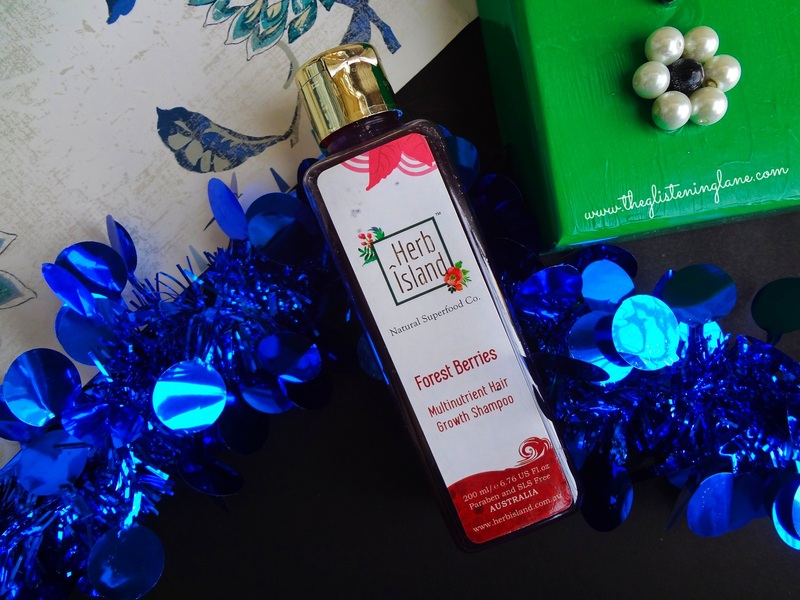 Key Ingredients: Grapeseed Extracts, Bear Berry Extracts, Soya Protein, Wheat Germ Oil – Specially formulated shampoo base with natural and skin friendly raw materials. Directions: Take a small amount and massage into wet hair for two minutes. Rinse well. Follow with conditioner. The reason as to why I opted for this one is simply the term “Hair-Growth”. But on the other hand it said “Forest Berries”. Now, I’ve always tried to ditch products that claim to be made from fruits, especially for my skin and hair. The reason being, anything to do with berries would be hydrating & neither does my hair nor my skin needs any external means of hydration and they’d probably work overtime to donate sebum to any third person as well. 😂 Also, the packaging states that it contains Wheat Germ Oil as well. Usually, a composition of such sorts extracts away volume from my hair. I have straight thin hair which looks lifeless if I shampoo with conditioner based hair cleansers. With the Herb Island Forest Berries Multinutrient Hair Growth Shampoo, I could literally see it did condition my hair to some extent & this enabled my hair to lessen any kinda of tangles & knots. It does not lather excessively but decent enough & I used it directly although I prefer to dilute my shampoo within water. Once my hair dried up naturally, there was slight frizziness but not much of a volume. I’d say it didn’t weigh down my hair because of conditioning properties but I couldn’t possibly see an improvement concerning volume. As to the claim of graying, *touchwood* I have none as of now so I can’t really testify that. But for hair loss, I couldn’t see any miracle as such. Perhaps with constant use, I might see some results. 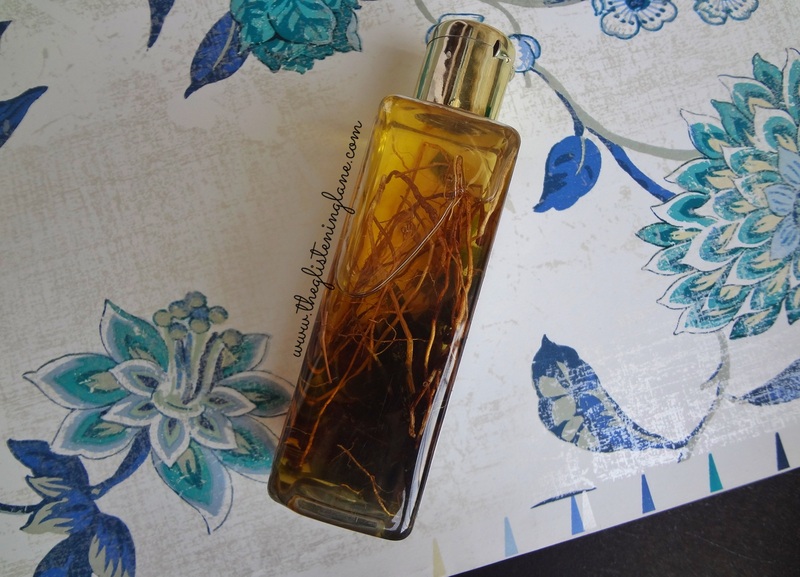 Description: A special nourishing hair serum infused with Moroccan Argan Oil, deeply smoothens the hair with a non-greasy feel and forms a protective layer on the hair’s surface to keep it from pollution and heat. Leaves hair healthy & smooth. Key Ingredients: Moroccan Argan Oil, Jojoba Oil, Almond Oil, Olive Oil in specially formulated base. Ingredients List: Absent yet again! Directions: Take a few drops and evenly apply on towel dried or dry hair. Comb with fingers to remove tangles gently. 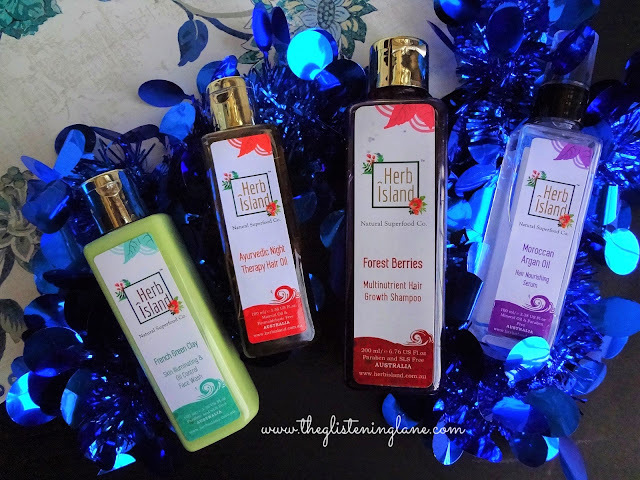 If you ask me, amongst all these products by Herb Island which one is my favourite, I’d definitely pick this one out here! 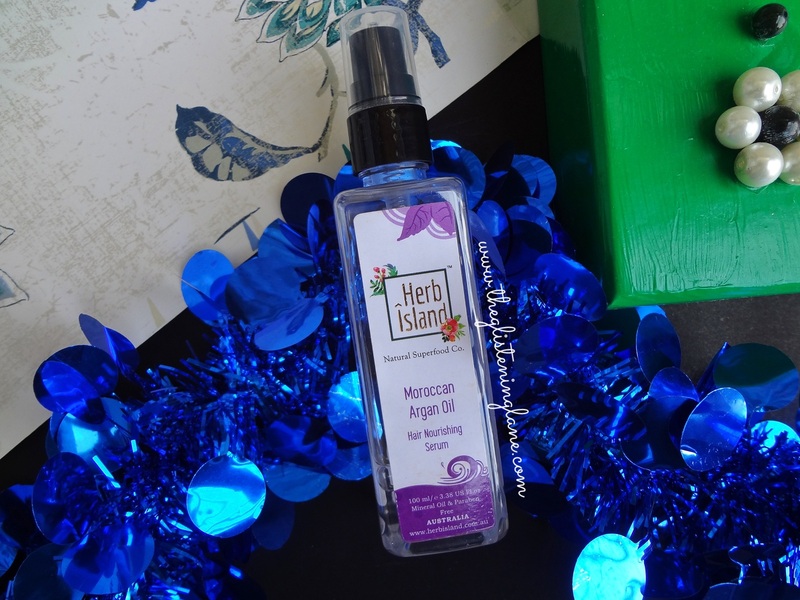 There was a dire need within my hair care routine to incorporate Moroccan Argan Oil. 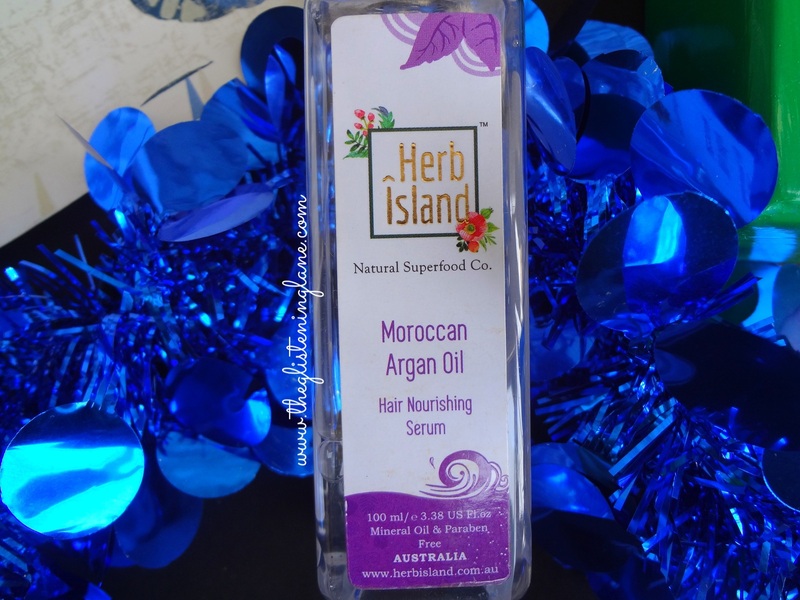 Argan being carrier oil can be used directly for hair care. I have had one by Ryaal but that one has a tiny bottle which made me save it for occasions. Because of the pump dispenser, you literally save product from being taken out in excess amount. Even though I hate conditioning my limp hair but this serum is really lightweight and caters softness to your hair with subtle fragrance. I’ve tried it onto semi dry hair & in no minute the shine was visible without being oily of course. For usage, a single pump of serum is enough. I’ve seen a lot of YouTubers use Moroccan Argan Oil as a heat protectant and even this one claims to form a protective layer around hair to safeguard them from heat and pollutants. 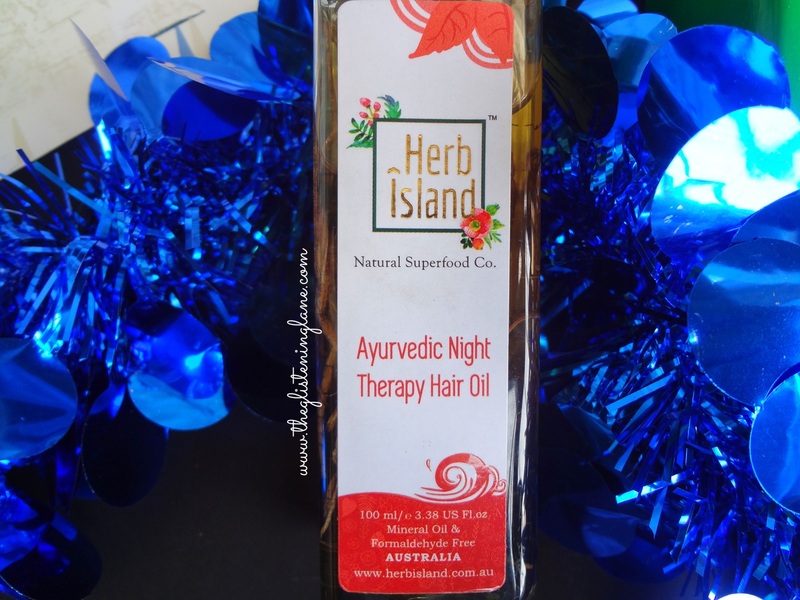 Description: This unique blend of 16 essential herbs and 5 oils is made with Kshir Pak Vidhi which works on your hair over the night to make it strong, smooth and shiny. It also stops premature hairfall and prevents headache and sleeplessness. Key Ingredients: Triphala, Bhringraj, Brahmi, Jatamansi, Nagarmotha, Henna, Sankhpushpi, Ricebran Oil, Olive Oil, Castor Oil in Coconut Oil and Sesame Oil Base. Directions: Warm small quantity of oil and massage onto the scalp. Leave it overnight. 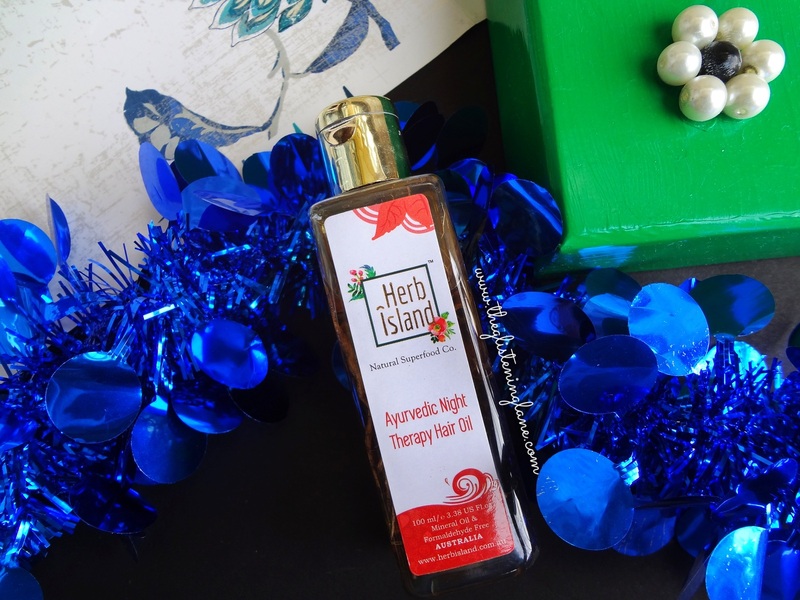 Now, in terms of the key ingredients mentioned on the packaging, it’s definitely endowed with some amazing amalgamation of oils. Triphala in case you guys don’t know comprises of goodness of three components which is why it’s known as “tri + phala”. Triphala on its own is a power-packed ingredient and can be used within so many things. In case you guys are interested to know how it can be used for your eyes, then feel free to leave down a comment and I’d think of either doing a separate post or DIY video onto it. Anyways, I kept the Herb Island’s Ayurvedic Night Therapy Oil all night long and in the morning washed it up without the usage of a conditioner to note down exact affect. It did leave the hair smooth and soft post cleansing but onto the aspect of reducing hairfall, I’m kinda unsure and saw no betterment. One could say it’s a little too early to notice any difference on hair volume or breakage but then I did come across some amazing Ayurvedic products which immediately cater results. I wish the brand would have disclosed complete ingredient list as well. The products look good. But the ingredients list is missing as you said. Btw, can you share a post on how to use triphala for eyes?